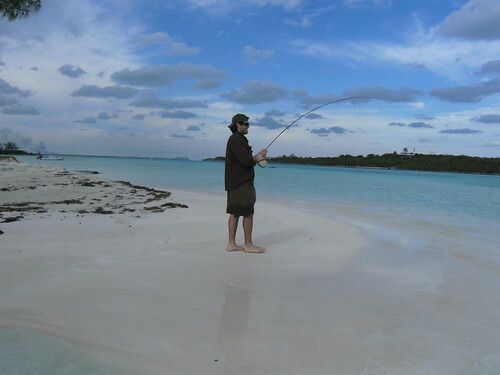 Taylor Brown sent in this recent report where he divided his time between breaking ice off the guides in New York, and wading tropical flats in the Bahamas. This entry was posted in fishing report on February 22, 2010 by Jason du Pont. 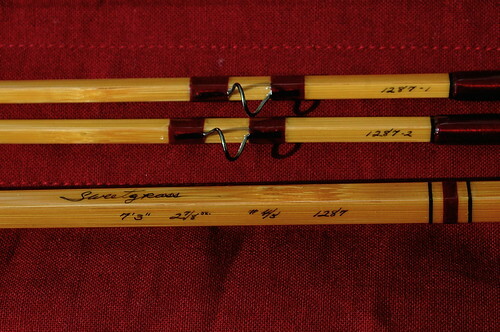 We recently received four Sweetgrass Bamboo fly rods in the shop with two rods in two different series. The Sweetgrass Series 7’3” Pent, 2 piece 4/5 weight rod above features two tips, agate stripping guide, sterling silver hook keeper, nickel silver ferrules, and polished nickel silver reel seat hardware. The rod is priced at $2000.00, and without the 15 month waiting period, it is no surprise one of these rods already sold quickly. Rod #1287 is available, although with quality craftsmanship and unique components, like the banded agate stripping guide pictured below, it may go fast. 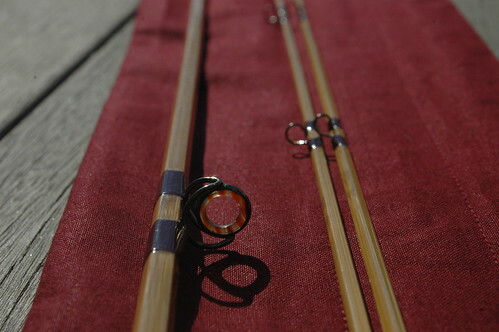 These 1-tip rods represent an unparalleled value in bamboo rods. With the same taper as our regular, Sweetgrass Series, the Mantra rods will delight with the same action you would expect from a Sweetgrass Rod. And at half the price, it’s a bargain in artisanal craftsmanship. 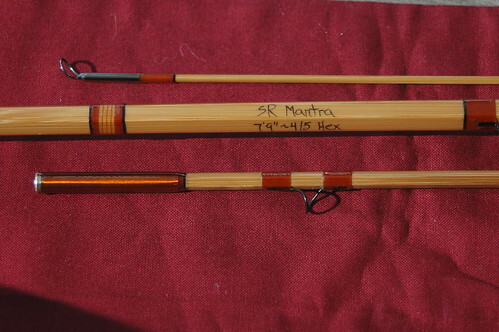 The Mantra Series rod pictured above is a 7’9” Hex, 3 piece 4/5 weight bamboo fly rod, which retails for $1250.00. 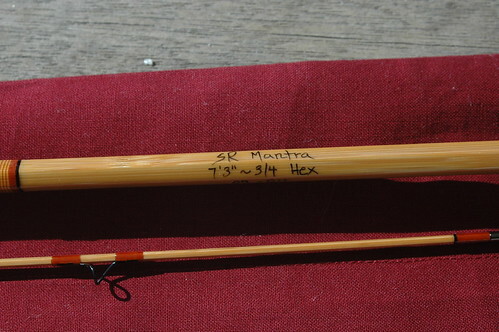 The Mantra Series rod pictured below is a 7’3” Hex, 2 piece 3/4 weight bamboo fly rod, which retails for $995.00. These five and six sided bamboo rods are ideal for fishing our local rivers and streams in the coming months. All three rods are in the shop for those interested in giving them a closer look. This entry was posted in gear, news on February 19, 2010 by Jason du Pont. 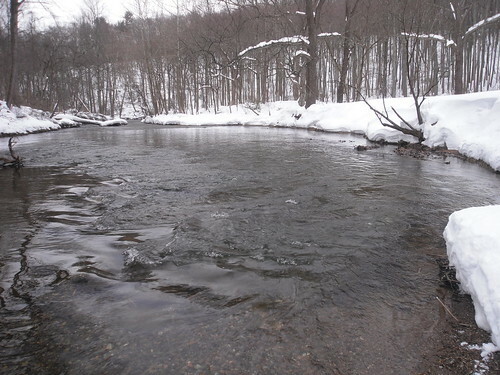 On Monday of this week it was time to put down the snow shovel and pick up a rod and head to the Gunpowder River. While the roads were clear, many accesses to the river were either not plowed, or plowed in with huge piles of snow. Masemore, Monkton and York roads had a few spaces cleared at each lot, and I saw a number of other anglers suiting up. Falls, Bunker Hill, Big Falls, and Blue Mount Roads had no parking, and much of Falls Rd was one lane. I parked at York and waded through the thigh deep snow to the river and snapped the pic above. The water temp was 38.1, clear and flowing at 120 CFs. After forty five minutes of fishing without a bite, I finally came tight to a brown in a deep hole, after countless other drifts in the same pool yielded nothing. I slowly worked two other pools for another forty five minutes without much action before heading home. Nymph fishing with heavy flies and long leaders will help get down to the bottom where the fish are holding and is one of the best options. Dead drifting buggers and streamers along the bottom has been consistently producing a few fish for patient anglers, versus anglers stripping streamers at faster speeds. Weather forecasts show possibility of more snow in the future, but the forty degree highs for the next few days may get the browns more active. Tom Starrs sent in another fishing report and the nice pic above with a wild brown. Tom, nice fish and nice hat too! 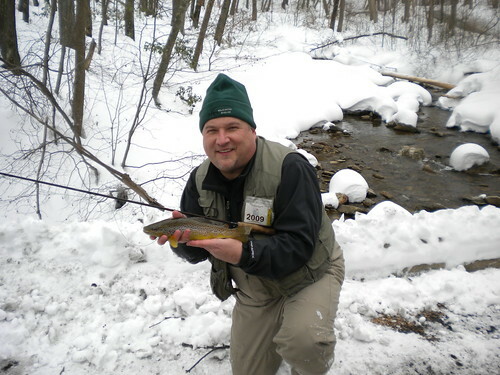 I took off President’s Day and fished a little Frederick County stream. With all the snow it is hard to find access to any stream. I did take this nice brown trout wearing my Backwater Angler hat! This entry was posted in news on February 18, 2010 by Jason du Pont. 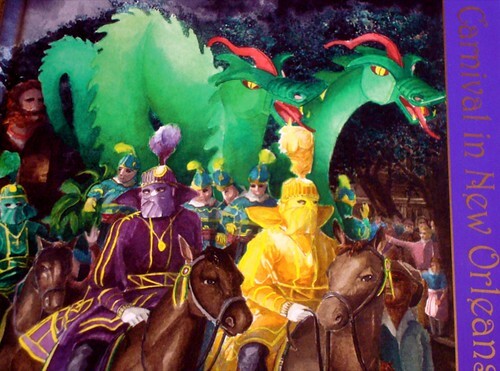 The shop will be closed on Mardi Gras Day, that’s Fat Tuesday, Feb 16, 2010 as our Backwater Angler guides get recertified in first aid and CPR-a handy thing to have on a day when beads and doubloons are being used as projectiles. 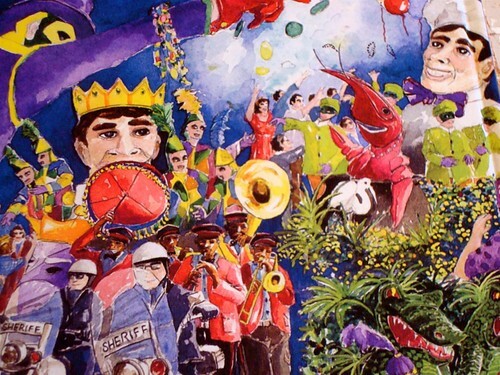 The shop will reopen on Wednesday at 10:00 AM, by then the lots might look more like pavement less like snow, until then enjoy the Mardi Gras Art from Robert Seago featured in a rollicking poetic take on Mardi Gras, the Big Easy and all of it’s denizens titled Carnival in New Orleans, a Fantasy by Maurice Le Gardeur. This entry was posted in news on February 15, 2010 by Theaux Le Gardeur. Fly Fishing Maryland? Please join us for an Intermediate Fly Tying Class on Saturday, February 20, 2010 from 9:00 AM till 12:00 PM. The class focuses on Cripple and Emerger Patterns. Our very own Gunpowder river guides will be teaching this challenging advanced class. Cost of the class is $45 per person, and includes the use of materials. Please bring your own tools.The class is limited to six and pre-payment is required. Please give us a call at 410-329-6821 or drop us a line at info@backwaterangler.com to register. 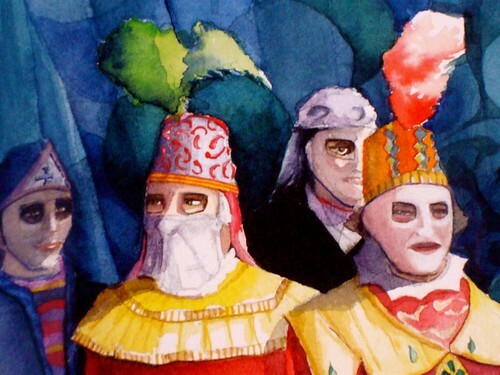 This entry was posted in events on February 15, 2010 by Theaux Le Gardeur. The shop will be open President’s day from 10 till 4PM. Been waiting for an excuse to book a guide trip for the spring? Celebrate Washington’s birthday by calling us today and save 20% on a prepaid half or full day guide trip to be scheduled for spring, summer or fall of 2010. Give us a call at 410-357-9557 or shop online and we’ll issue a gift certificate for a half day or full day guide trip that you may redeem when the weather breaks. Sulphurs are just a few months away! 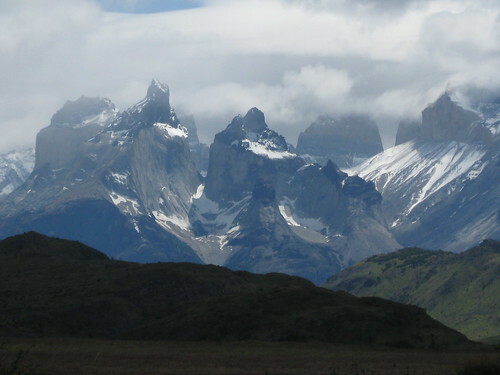 Willy Palmer sent us this picture and short report after returning from a recent trip to Argentina. I see you mentioned Argentina in your recent web update. Thanks for all the help with tackle in preparation for the trip. I’ll fill in details later, but the fishing was great, the people delightful, and too much wine and food. As you can see, they know how to grow big ones in the lakes. I had several bigger, but was under strict rules not to come home with too many hero shots. This entry was posted in fishing report, news on February 14, 2010 by Jason du Pont. What I would give to see a blade of grass. The plug the CAT C 12 gingerly placed across the front of my drive is now cleared. 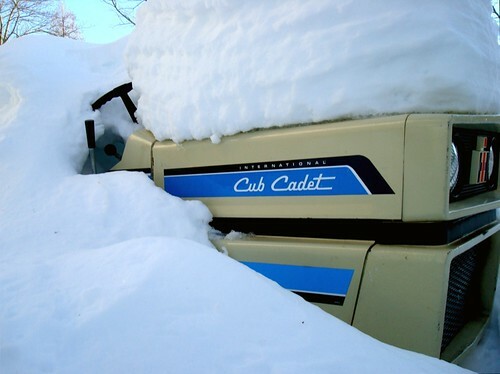 The impending snow shovel shortage awaits! 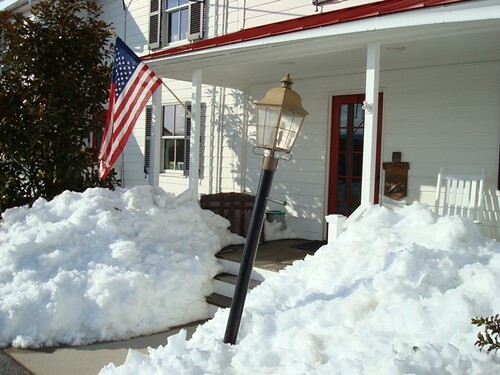 I have one snow shovel left, the other expired in the early dawn hours Wednesday on the warm side of the house where the heat from the big wood stove full of red oak turned the powdery light stuff on the walk into an ice crystal slurry mess. “Split handle?” “Cracked blade?” “See it all the time,” may be part of the new fly shop vernacular. I’m certain that by the weekend, there will be run on salt, those fancy reflective driveway markers my neighbor uses to prompt the snow plow man to “do the right thing” and mailboxes. At the shop the half round gutter over the side porch could use a bit of a lift, otherwise the lot is plowed and we’ve seen a few fisherman today-some getting ready for trips to the Bahamas, Tierra del Fuego, and Argentina and even one fishing locally. The 23.2 inches in December now pales in comparison to the 79.9″ reported this season in, The Stats are In, by Frank Roylance. At this time we’d like to remind everyone that if you’re planning on fishing next week, as of today the river is clear, the lots are not and the trails are treacherous. Be sure to bring a shovel to clear a space along the river if you dare–the fish are waiting…Stoneflies are on the way. This entry was posted in fishing report, news on February 12, 2010 by Theaux Le Gardeur. 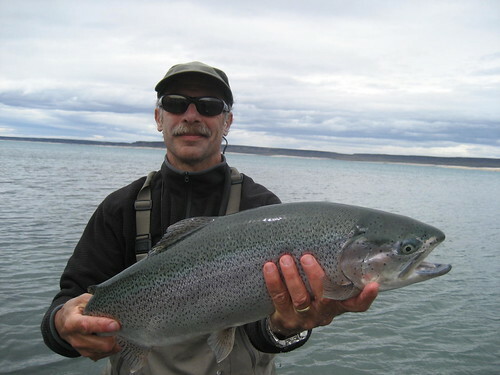 Thanks to Max for the stream report and photos from a recent fly fishing trip to Chile. 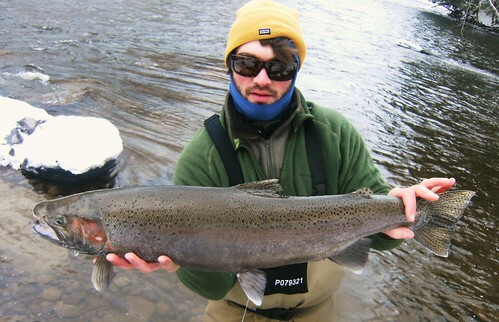 Testament that Backwater Angler interns know how to spend a few weeks in January down South. Just wanted to tell you a bit about our trip to Chile this past month. We fished in the Torres del Paine National Park near Punta Arenas for a few days, catching big browns in the 22 inch range. We were fishing with a few guys who are opening a guide service next year, and they were really helpful in showing us where the fish were. 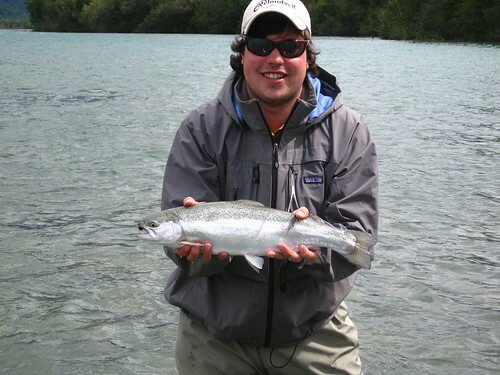 We fished small rivers that feed into the third largest lake in Chile ( Lago Toro). Our favorite stream was a secret spring creek. Alex caught and landed a huge brown that measured 24 inches and must have weighed about six pounds. Between us we didn’t catch a single fish under 18 inches at the Torres del Paine. We didn’t catch huge numbers, but the ones we did catch sure were large! After Torres del Paine, we flew north to Puerto Montt where we met up with a friend of mine Carlos Klein (who is a guide in the region). 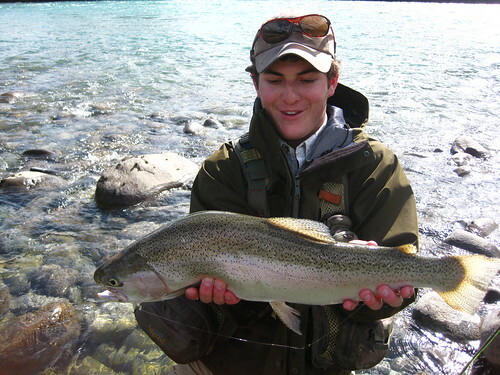 Our destination was the Rio Puelo, a huge river that is home to an extremely large population of big rainbow trout. We stayed in a very comfortable cabin that belonged to Turismo Rio Puelo, a guide service owned by one of Carlos’ good friends. We spent the first evening tying flies and eating asado de cordero (Chilean lamb roast) with ten other guides from the area, trading fishing stories and fly patterns, and talking about what we would be doing the next day. The myth on the Puelo river is that one can only catch fish on big streamers and sinking lines, but we heeded Carlos’ advice and fished big hoppers with nymph droppers. Alex and I immediately started catching big rainbows in the skinny riffles, water that most fisherman would ignore. On the first day, we caught most of the fish on dries, but Andrés (another member of our group, and former Rio Baker guide) managed to land a large bow on an orange and black white legged bugger he had tied the night before. 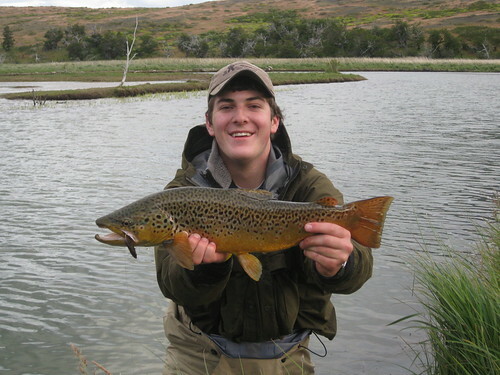 The biggest fish of the trip came on the last day at the Puelo, and Alex was the lucky fisherman. He tied on a birds-nest nymph, told me it never failed him, made a long upstream cast, and hooked a 25-inch 10 pound rainbow. At first he thought he was hooked on bottom, but when I walked up next to him, i could clearly see that the line was slowly moving towards the fast current mid-stream. I told him to keep the pressure, and just as he began lifting his rod, the fish decided to run. I have never heard a reel scream so loud, or seen such a huge fish racing upstream in 5 inches of crystal clear water. Alex and i chased the fish for over 20 minutes before the beast was in the net. We took some pictures and then quickly released him. Alex and I decided to end the fishing with that catch, so we returned to the boat with a nap in mind, but instead ended up watching another fisherman haul in a 35 pound Chinook salmon… We intend to return to the Puelo with spey rods and heavier equipment…My 7 weight Sage Z-Axis performed wonderfully against big fish and the heavy Austral wind, but it would have been no match for a monster Chilean Chinook. If you are interested in fishing in Chile, send me an email and I can give you some tips as to good places to go, and good people to contact down there. This entry was posted in fishing report on February 12, 2010 by Theaux Le Gardeur.